4. You must have a gmail/email or Skype, something I can contact you. Here's what's the series is about, Vocal Chorus is and MMD web series about a girl name Miku who dreams of becoming a famous singer one day to inspire others. One day she enters a singing audition. She wins the audition and is accepted into an academy called Musical Academy. When she got to Musical Academy she met a boy name Dell, who is link to a missing vocalist and student name Lapis Aoki, who is also Miku's old childhood friend. She teams up with Dell to find her lost friend, along the way she meets other students who are linked with the clues that leads where Lapis is. It is a mystery, comdey, music/vocaloid based theme kind of a series. Bio: Len is one of the winner of the audition held to enter Musical Academy. 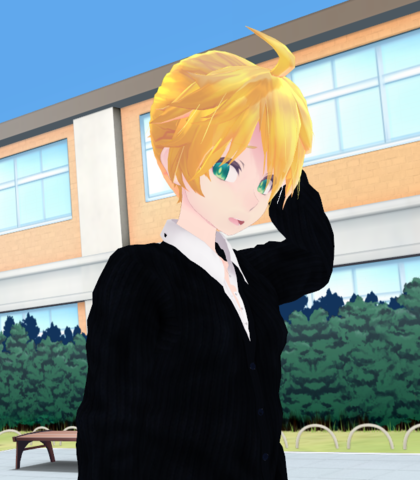 Len can act like a pervert at times and often attempts to flirt with Miku but fails. But he's a nice and friendly guy who helps Miku find Lapis later on in the story. Len is a supporting character but does have a purpose in the story and he does sing in this series. "You know, I like you. Hi I'm Len"
"Oh Kaito-chan! I'm ready for our duet!" For this role, you can do both or just one of them, as long as you do the singing part as well. Bio (for the both of them): V is a crossdresser who attends in Musical Academy. V acts mysterious and keep his distances with the other students. V never reveals his name for mysterious reasons, and calls himself V. When he dresses up to his normal self, he gives himself the nickname V4. No one knows his secert on being a guy except of Miku, who finds out later in the story. V/V4 is a support character but has a MAJOR role in the story. He also sings as a girl (V) and a boy (V4). "O-Okay. You can stop hugging me now"
"I can handle this on my own"
"That's a long story...but nobody cared how I dressed like so...I never changed"
"Okay. You don't have to be all werid about it. Let's just get back to class."